Matt Frank & Jeremy Robinson, the creators behind Godzilla: Rage Across Time from IDW Publishing. 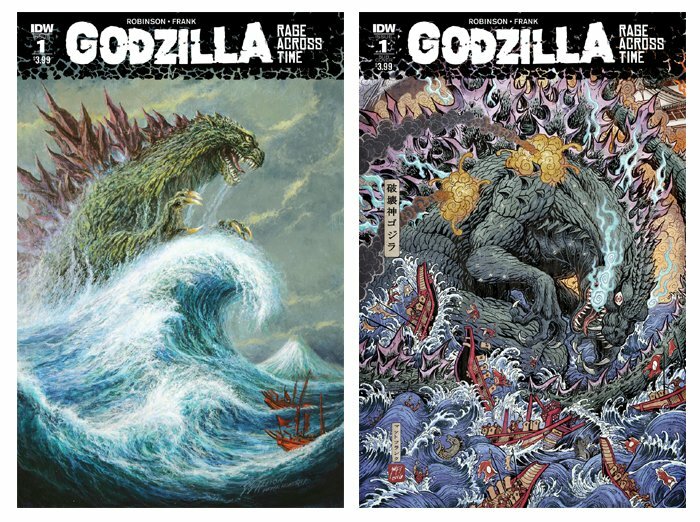 For this episode, Kyle welcomes the creative team behind the first issue of IDW Publishing’s upcoming series, Godzilla Rage Across Time, Jeremy Robinson and Matt Frank. While Matt has been on the podcast before, Jeremy’s name may sound familiar because of his contributions to the kaiju genre via the literature branch. Jeremy is the author of the Project Nemesis books. The two were tapped for their concept tale in which Godzilla appears in fuedal-era Japan. Move over dinosaurs… monsters used to rule the planet! Travel to different time periods to examine the origin of myths that fueled nightmares! In this first installment, Godzilla brings his terror to feudal Japan! We are watching Trollhunter (2010) this month! If you’d like to submit your “homework” for the discussion episode, make sure you send in your thoughts, questions and reviews before July 22nd to be included.